Thanks Jackie! You made me feel comfortable right away. Using your services was the best decision I ever made! 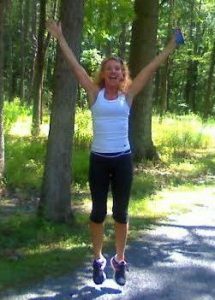 -Cynthia E.
My name is Jackie and I am a Certified Personal Trainer in Nazareth PA and around the Lehigh Valley here in Pennsylvania. I have nearly two decades experience in fitness, nutrition and mind & body reprogramming. I have integrated my experience and education to create a superior training program that approaches fitness from three key angles. My three part curriculum is designed to insure your success by focusing on Nutrition, Exercise and Subconscious Reprogramming so that eating the correct amounts of healthful foods and exercising regularly becomes habit. The first part of your program will consist of Cardiovascular Conditioning, Strength Conditioning, Core Stability Training and Balance and Flexibility. The system works multiple muscle groups simultaneously, with the goal of creating a strong and balanced body. It utilizes the most progressive techniques, including TRX Suspension Training and Functional Strength Training. This targeted, rapid results system is ideal for anyone seeking peak physical conditioning. As a fitness professional I feel it’s my duty to not only help my clients gain strength and endurance, but improve their overall health with a nutritional approach to fitness. Along with customized workouts, I can help you implement a nutritional program that can greatly improve your health. I will design a program around your metabolism. A proper nutrition program is essential to getting your body at its best in order to burn fat, increase energy, performance and affect mood positively. Lastly, I believe change must take place in the mind to have permanent positive changes in the body. Most knowledgeable people will agree that the mind is an extremely powerful when used in conjunction with proper diet and exercise can generate the power to make permanent, positive behavior changes. Once you learn how to put your full mind to work for you, your potential is unlimited. Jackie not only helped me gain muscle tone, she gave me the ability to stick with the program. This has brought my much joy, as it is the first time in twenty years that I have followed through with a fitness routine! -Mark M.